The Jetsons-inspired future that we all dream of inched a little closer to reality today with news that the Terrafugia Transition, a flying car developed by MIT-trained aeronautical engineers and MBA’s, will begin limited production in late 2011. The vehicle will be produced in Woburn, Massachusetts–just down the road from company headquarters–with help from 50 lucky workers who will be able to say that they build the futuristic vehicles we were all promised as kids. The Boston Herald reports that Terrafugia needs to deliver 30 aircraft each year to stay in the black. That’s not an easy feat for an entirely new breed of vehicle that costs up to $250,000 a pop. 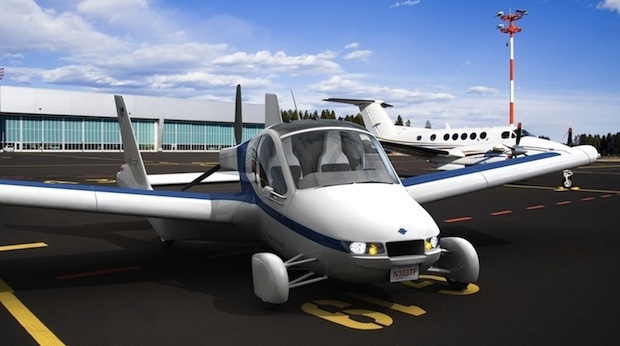 But Terrafugia already has 85 orders for the FAA-approved flying car, so the company can at least make a go of it. It’s street-legal, remember, but that doesn’t mean any public road can be cleared for takeoffs and landings. Still, we’re a little wary of the Transition’s potential to wreak havoc on the roads. Drivers (or pilots) need to have a Sports Pilot license to operate the Transition, but that’s an easy requirement to fulfill–20 hours of flight time and a practical test are all that is needed to become certified. With a cruising speed of 115 mph and a 400 mile-range, there is plenty of room for pilots to enter dangerous airspace, either accidentally or on purpose. So here’s hoping that Terrafugia works out the logistical kinks of this thing before the first big flying car accident.